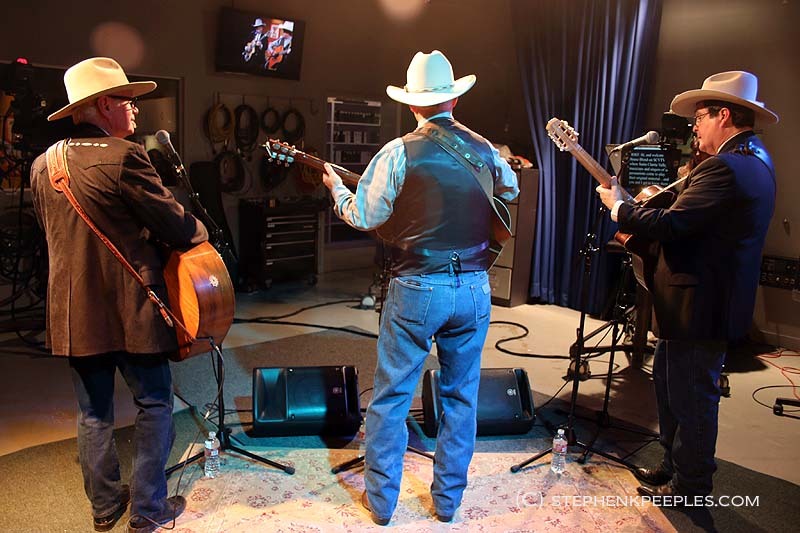 Legendary California cowboy band New West takes the stage on an all-new edition of SCVTV’s popular “House Blend” series hosted by Santa Clarita journalist Stephen K. Peeples, premiering Saturday, April 12, at 10 p.m. (Pacific). Fronted by singer-songwriter-guitarist Mike Fleming and featuring lead guitarist-vocalist Raul Reynoso and bassist-vocalist David Jackson, New West has been together more than two decades, and have three albums in their catalog (plus a Reynoso solo album). 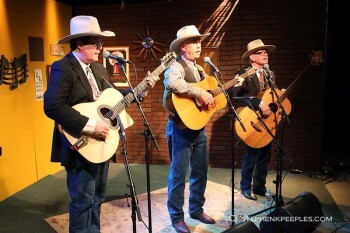 The Santa Clarita-based trio’s original songs, three-part vocal harmonies and acoustic sound celebrate the West, the contemporary cowboy lifestyle and the rich history of old California, with great authenticity, depth and humor. Winner of three “Best Song” awards from the Academy of Western Artists and the Western Music Association, as well as the Will Rogers Award for “Best Western Group,” New West has toured the Midwest in as part of the Arts Midwest and APAP touring programs. The group has been a featured act at the Elko Cowboy Poetry Gathering, the Santa Clarita Cowboy Festival and the Strawberry Music Festival in Northern California. They also have a month-long tour of Arizona under their belt buckles. The longtime friends and musical partners recently reunited after a few years rambling in other directions, and picked up right where they left off. 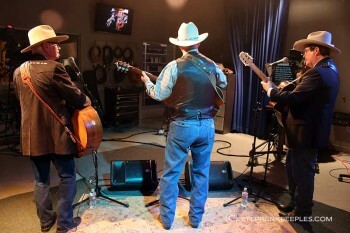 On “House Blend,” Fleming, Reynoso and Jackson perform “Texas Moon” from their 1997 debut album “Texas Blues”; and “Line Rider’s Waltz” and “Buckaroo Dream” from their 2001 “Buckaroo Dream” CD. The fourth song, “On California Ground,” is a gorgeous slice of old California history Fleming wrote for as part of a grant to the Cowboy Festival from the NEA, which commissioned songwriters to create works about California history. A CD compiling those works is out of print, and New West’s “House Blend” performance marks the first time the trio has been able to perform it live on television. Between songs, Peeples chews the fat with Fleming, Reynoso and Jackson, and digs a little deeper into the trio’s colorful past, individually and collectively. We hear how Fleming grew up the cowboy way, how Reynoso brings elements of his own Hispanic heritage and love for Gypsy jazz legend Django Reinhardt into his New West guitar work, and where Jackson got his huge acoustic bass, which is about half as big as he is. 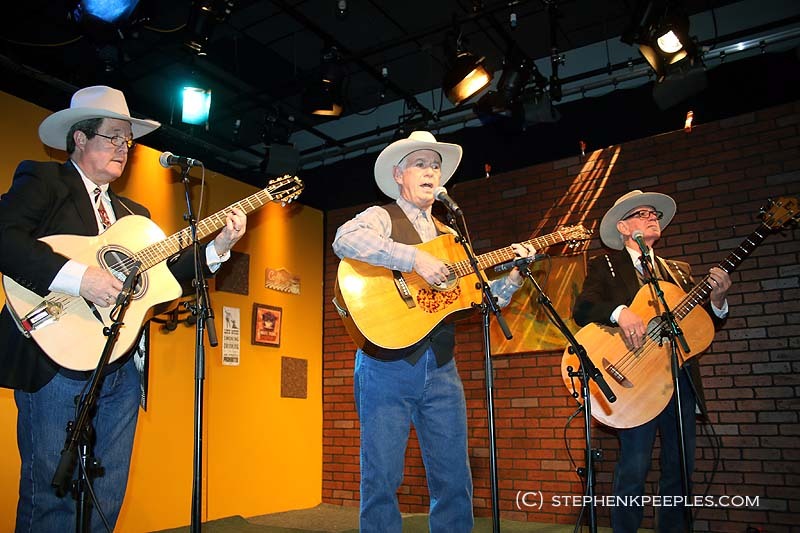 The trio’s “House Blend” guest spot airs just before the 21st annual Santa Clarita Cowboy Festival April 24-27, so we also get a few fascinating tidbits about the Santa Clarita Cowboy Festival’s history. Find out more about New West on the trio’s official website. Time-Warner Channel 20 in the Santa Clarita Valley and AT&T U-Verse 99 in L.A.-Orange counties telecast the “House Blend” series, a presentation of SCVTV, community television for the Santa Clarita Valley. SCVTV’s “House Blend” also streams live at the same time at www.scvtv.com. Santa Clarita journalist Stephen K. Peeples books, researches and writes “House Blend.” Peeples and SCVTV studio director Megan Perez co-produce the series at the SCVTV Media Center in Newhall, Calif. Perez also directs the show and the production staff, ably assisted by renowned TV sound sound engineer Mike Mazzetti. SCVTV President/CEO Leon Worden is “House Blend” executive producer. 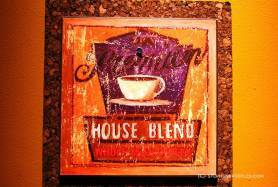 The first “House Blend” show debuted in September 2010 on SCVTV. The shows air and stream Saturday nights at 10 (PT) with an encore telecast/stream Thursday nights at 10. “House Blend” is now wrapping up its fourth season and is one of SCVTV’s most-watched programs. All shows produced to date – more than 40 original editions with music and interviews and a dozen all-music best-of compilations – are archived and viewable on demand. A series highlight was the WAVE-nominated May 2011 show featuring renowned folk-country-bluegrass duo Chris Hillman and Herb Pedersen, one of the top finalists for a WAVE award from the Western Alliance for Community Media. Read more here. Santa Clarita journalist Stephen K. Peeples is a features writer and photographer for KHTS Radio News (hometownstation.com) and SCVTV’s SCVNews.com. He also writes the occasional post for his own website and independently provides Web editorial and social media services for select clients. On TV, Peeples is host, writer and co-producer of the popular “House Blend” music and interview show on SCVTV, community television for the Santa Clarita Valley (scvhouseblend.com). In addition, he delivers the KHTS/SCVTV “SCV Entertainment Beat” report Wednesday night during SCVTV’s NewsBreak program. Contact him at skp (at) stephenkpeeples.com or visit http://www.stephenkpeeples.com.